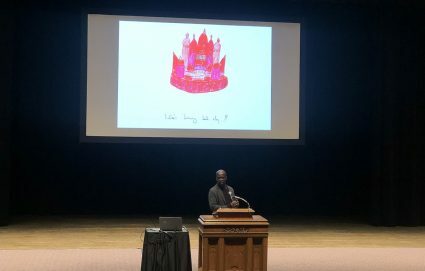 Architecture students, art buffs and just over all enthusiastic San Antonians gathered at Trinity University’s Laurie Auditorium on Tuesday evening to hear Sir David Adjaye speak on the highly anticipated Ruby City, the two-story building south of downtown he designed to hold Linda Pace’s art collection. The modern-looking crimson building is scheduled to open Oct. 13 at 150 Camp St. Architectural Digest called it one of the 14 most anticipated buildings of 2019. The evening began with the story of Ruby City’s origins. In 2006, Pace, the late San Antonio artist and philanthropist, was visiting London with friends and collectors to see art. Among the friends was filmmaker Isaac Julien, who Pace had known since the mid-1990s, and who was also a trustee of one of Adjaye’s first cultural buildings in East London. Pace was so partial to the building, she told Julien to introduce her to Adjaye, and the two hit it off immediately. Adjaye joked that Pace was such a visionary that she must have had the gift of foresight. The next year, Pace hired Adjaye for the project, and Adjaye would make two visits to San Antonio. Pace explained to Adjaye in detail the history San Antonio’s history and the importance of its indigenous heritage. She took him to the Spanish colonial missions, which Adjaye described as inspiring and powerful. He believes that it’s important to look at past generations when sculpting for the future. During Adjaye’s two visits to San Antonio, Pace lived in her apartment on Camp Street near Ruby City’s future location and not far from where an old ice house stood. 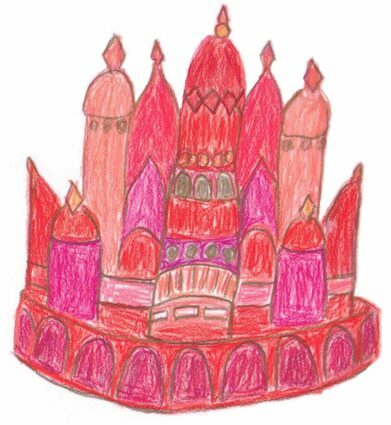 Before one of his visits in 2007, after sitting on the idea for some time, Pace presented Adjaye with a “brief” of an idea for Ruby City: the sketch of a scarlet city she had seen in a dream. He was only able to show her a few of his own sketches in response—ideas he had for interpreting her vision—before she died of breast cancer in July. They worked through many models, studying form and light. His focus was to bring in “zenithal light” with the notion that art spaces are backdrops to the art itself, understanding the color of light that illuminates the art and its different frequencies. The lighting in the galleries themselves pay homage to the different types of studios that artists may work in, such as factory buildings or converted sheds. The building’s form on the outside looks like it’s constantly changing—different at every angle—while the inside was inspired by the circular walkways around the missions. It starts one place and ends back where you started, where you could almost walk around the building continuously. Every detail was thought out and had a purpose behind it. The entrance, for example, is a very shaded and dark space, a refresher for the eyes and a “retinal adjuster” to the lighting and tones that greet you when you enter. 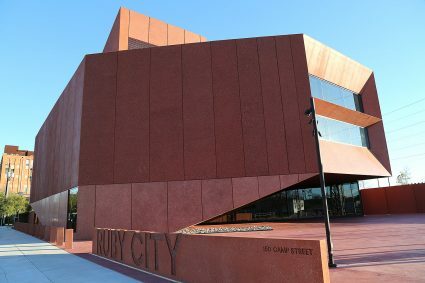 Accomplishing the vivid red color of the exterior was no easy task as red concrete is almost impossible to create and keep bright without fading. With the help of a precasting company from Mexico City by the name of Pretecsa, they tested many samples outside until they finally got what Adjaye was keen to make. The most prominent features of the entire building are the three giant windows that Adjaye refered to as “lenses” that tie together the relationship with the outside world with the spaces the art collections will occupy. The main window in the front, “the eye of the project,” faces the San Pedro Creek, which Adjaye described as the origin of the city. Indeed, city archeologists believe the Mission de Valero, which would be later dubbed the Alamo, was founded on the creek near the present day San Francesco Di Paola Catholic Church, about 1½ miles north of Ruby City. The window also overlooks a plaza sculpture garden and potentially an amphitheater as part of the San Pedro Creek restoration project. The second “lens” illuminates the staircase that goes around the building, creating a “lightwell.” The third “lens” is focussed on the center, inviting you to get closer and sit down. Adjaye called it a space to reflect, as it overlooks Chris Park, the space on the opposite site of Camp Street named after Pace’s son, Chris, who passed away at age 24, and to the San Antonio’s skyline. From my untrained view, it looks like a bunker.